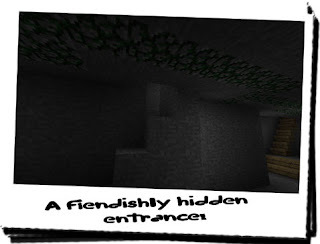 Diary of a Miner: Day 37: More intrigue the more I find! Odd; I had that dream again, the one with the hooded figure and the spider! Except this time, I managed to kill the spider; instead of turning and running, I took out a small dagger and waiting as it scuttled towards me. When it lunged at me, I dodged out of the way and drove the dagger deep into the spider's head! I didn't know whether that killed it, because I didn't stay around long enough to find out! I went looking through the wall that the spider had emerged from and saw a small passage leading away from the temple. It was very narrow, barely wide enough for me to run down, but I managed it. Part way down I must have set off a trap, because the next thing I knew I was clutching my neck where a dart had appeared and I was losing my vision, slowly falling to the floor. Despite the dream, I didn't wake up suddenly, my mind was just blank from my demise to when I awoke, presumably! I don't get what they refer to, and I have become increasingly worried as to my safety the more I uncover! 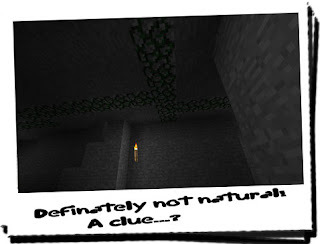 A large part of me just wanted to leave this mystery alone, and get on with some mining as though nothing had happened! But unfortunately it was the smaller, more adventurous side of me that had the controls! However he seemed to be late, because when I awoke, the sun was high in the sky, it was almost midday! All this exertion must have taken its toll! Not wanting to waste any more of what was a seemlingly good day, I arose and pretty much went straight back to the dig site without breakfast! With pickaxe in hand, I stood at the junction, ready to take on anything that could be thrown my way! I had already explored both junctions and found nothing, although I wasn't very thorough with the right junction near to the spring. Turning down that tunnel, I climbed the already present wooden staircase and dug around for a bit in random directions. It occurred to me that at this rate I would dig through to the surface... perhaps under the water and end up flooding the whole place! After this thought, I stopped pretty sharpish! After climbing down, I noticed a strange tint of green to some of the stone embedded in the ceiling and stopped to have a look. It was the same mossy cobblestone I had found twice before, but it seemed to be placed randomly on the ceiling. I followed the mossy cobblestone and was amazed to find it lead back to the junction. From there, one direction went out of the dig site, and the other went straight to the wooden staircase I descended yesterday! Was this a hint? This definately wasn't a natural occurrance; moss doesn't grow in straight lines, and more to the point, if it was it would grow more abundantly around the spring where the air is moist and oxygenated! This however was a pattern! I stood in the entrance and looked both ways, and then looked up and noted that there was a mossy cobblestone trail leading down both paths! This didn't really have any significance, until I noticed that a small section of cobblestone ran into the wall straight ahead! It wasn't very significant and initally I thought it might be to make it less obvious, but the more i thought about it, the more sense it made. Maybe it was a map of the caverns and tunnels here, and two of them I had already found! That meant that there was still another tunnel to search for straight ahead! Instantly, I began hacking at the Northern wall, spraying the surrounding rock with bits of stone! After ten minutes, I had made a sizeable chunk in the wall, but had got nowhere! I had initally thought that there may have been another wooden barricade in the way, but nothing! I continued anyway until I noticed a small stream of light pouring in from a small crack! After a further few minutes, I had expanded the crack into a hole and noticed wooden steps and torches on the wall! I had been right, although I was digging from the wrong place. I returned to the front of the wall, and began digging up straight away, and within minutes, more light poured out from the hole. After a good twenty minutes or so, I had made a big enough hole to fit into! I climbed into the hole and went around the intial stone corner and found small wooden steps and the hole I had made with the first attempt of getting in. Continuing along, a few moments later I came up to a wooden barricade - honestly, I get the feeling someone really doesn't want me going in there! If they'd used a stone wall it would've been fine because I wouldn't suspect anything, but a strikingly obvious wooden wall... There was something afoot! To make it more obvious there was a sign affixed to the barricade saying "! WARNING! KEEP OUT ! WARNING !". I took out my flint lighter and made short work of the barricade! After waiting for the barricade to burn down, I went on through and continued down the tunnel, expecting to see row after row of barricade! But it was a very long stone tunnel which seemed to go on for some time! After awhile, the tunnel came to an abrupt end at the beginning of a very long staircase descending into darkness. I readied my pickaxe as a weapon and descended, torch in the other hand! After what seemed like eternity I came across a large dark-stoned wall. I say "came across" but in truth I bumped into it! It was an obsidian wall, which annoyingly doesn't reflect light and is very hard to see! 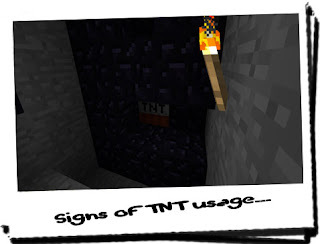 I placed the torch on the ground and began feeling at the wall; it wasn't smooth like I expected, but had rough edges and there was a small hole in which I found a block of TNT buried in it! I picked up the torch and shone it around; there was traces of explosives everywhere! The size of the stairwell was about that produced by a small controlled explosion! There was still a small fuse connected to the TNT, so I do the only logical thing, and lit it with the lighter! I ran back up the stairs and shielded myself from the blast! A few seconds later, a thunderous roar echoed throughout the stairwell, and fragments of stone flew towards me! After a few seconds, I stared down at the hole - or where the hole should've been, but instead, was a slightly bigger hole in the obsidian than there was before! I remembered that obsidian was the "Miner's Achille's Heel"! If you came across it, the best thing to hope for was that you could tunnel around it! Either that, or you had enough TNT to destroy the majority of the world! There was the final option of using a diamond-edged pickaxe, but it was labouriously slow, however it allowed the miner to preserve the majority of the mined obsidian! What with obsidian being incredibly precious, many greedy miners had died attempting to excavate it, whilst the majority avoided it like the plague! I didn't have anywhere near enough TNT to blow this lot up - the small amount I found yesterday was smaller than the stuff I just blew up! I decided to try the second option and dig around it, but after three hours of trying every conceivable direction, all I managed to achieve was to unearth more obsidian! This left the one option that I really didn't want to consider! I would need a diamond-edged pickaxe, but the only diamond I had was back at the house! I was unlikely to unearth any diamond here because of the rarity of it! I went back up the stairs, feeling very defeated! This obsidian wall was here for a purpose, and it was important enough for someone to try and destroy! I returned to the surface, wondering what the best course of action would be! I've prepared the boat for tomorrow, and I've decided to catch some early shuteye; tomorrow is going to be an exhausting day, and I needed my rest as it is!